A crepe bandage is a bandage made of light material (usually cotton, cotton & wool or rayon & cotton). It can be wrapped around different body parts and is used generally for sports and orthopaedic injuries such as cramps, sprains, strains, dislocation and aches. A sprain occurs when a ligament gets stretched or twisted and commonly happens on the knee, ankle, wrist and thumb. A strain occurs when a muscle has been overly stretched or contracted and commonly happens in the hamstring, calves, quadriceps and lower back (lumbar muscles). Crepe bandages are also used as a pressure dressing for burns, for varicose veins and where ever elastic support is needed. They are elastic, stretchable, breathable and comfortable to wear and provide uniform support. They are generally washable and come in different colours. They are used extensively for home care and also form a part of first aid kits. Crepe bandages are used very extensively for ankle sprains, foot sprains and wrist sprains. What should one look at while buying crepe bandage? 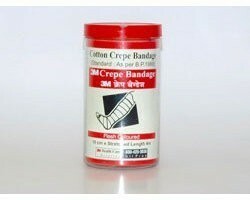 Smart Medical Buyer stocks the widest range of Crepe Bandages online in India. We provide the lowest prices online, multiple payment options and same day dispatch for these products. We have a direct tie ups with manufacturers and thus ensure that you get crepe bandages at the best prices online in India. These are available in sterile and non sterile variants. 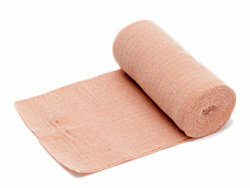 Crepe bandages are available in 3 different colours in our site. We offer crepe bandages in multiple sizes including 5cm * 4m/ 4.5m, 6cm * 4m, 7.5cm 8 4.5m, 8cm * 4m, 10cm * 4m/ 4.5m and 15cm * 4m/ 4.5m. As a hospital, nursing home or primary care centre, you can buy crepe bandages small and large quantities on Smart Medical Buyer at the lowest prices available online in India.